During the 1830s several new attempts were made to bottle mineral waters and the introduction of a bottling machine leads to one of the first successful ventures in bottling mineral waters. Up to this point the embossed bottles are only found from Philadelphia, but now we start to see activity in other cities including New York, Charleston, and Albany. Each city will be address separately. At the end of this decade, the fuse is lit that will lead to the explosion of artificial soda and mineral water bottlers. Finley & Phin were druggists in Charleston South Carolina. James Edwards Burr Finley was a physician in Charleston and was the son of James Edwards Burr Finley, a Massachusetts surgeon who served in the Revolutionary War and later removed to Charleston. Finley was an 1829 graduate of the recently established Medical College of South Carolina in Charleston. The college opened November 8, 1824, with the first commencement exercises April 4, 1825. Finley partnered with Dr. D. D. Graves under the firm name of Graves & Finley at 48 Broad Street. In the 1835 Charleston Directory, he is listed as a doctor at 4 Church. Alexander C. Phin was a Scottish emigrant who was born in Dundee February 17, 1810. He was listed as a chemist in the 1835 Charleston Directory at Chalmers St., op. the Depository. In the same directory, Graves & Finley were listed as druggists 50 Broad Street. At this point Finley and Phin were not partners. THE Firm of Drs. GRAVES & FINLEY, was dissolved, by mutual consent, on the 18th October last. Dr. Graves having purchased the entire Stock, will continue the business on his own account, at the Store lately occupied by them, No. 48 Broad-street. All persons to whom the Concern is indebted, will render in their accounts for settlement; and those indebted, will make payment to either of the Subscribers. THE Firm of Graves & Finley having been dissolved, Dr. J. E. B. Finley has associated with him, Mr. Alexander C. Phin, and will open a DRUG AND CHEMICAL STORE, at No. 31 Broad-street, under the firm of FINLEY & PHIN, as soon as a new Stock can be obtained, and the Store adapted to the purpose. They solicit a share of the patronage of their Friends and the Public. J. E. B. FINLEY. No doubt it took some time for Finley and Phin to get their store furbished and to get supplies ordered and shipped to Charleston. The first ad for Finley & Phin, with an operating store, appears in the March 31, 1836 edition of The Charleston Courier and ran for several months. I doubt this bottle dates to 1835 as some have put forth. Bottling of mineral water was basically a summertime business with bottlers primarily operating from Memorial Day to Labor Day. Since Finley & Phin did not partner until November of 1835 and they needed needed some time to get their store furbished and stocked, and since the 1835 bottling season was over, it just does not make sense that this bottle dates to that year. DISSOLUTION OF PARTNERSHIP.-The business heretofore carried on in the name of FINLEY & PHIN, is this day dissolved by mutual consent. All demands against them are requested to be presented; and those indebted, to make payment to either of them. The name of the firm will only be used in settling the same. CARD.-The undersigned having purchased from Dr. Finley, his interest in the above firm, intends carrying on the business in the future on his own account, and trusts from his long experience and knowledge, with the strictest attention to business, to merit a share of that patronage so liberally extended to the late firm. A. C. PHIN. CARD.-The subscriber gratefully returns his sincere thanks to his friends and customers for the very liberal patronage bestowed upon him for the last nine years, and respectfully informs them that on account of bad health he has disposed of his business to Drs. Allan & Fayssoux, and sincerely solicits a continuance of the same patronage in their behalf. THE UNDERSIGNED having purchased the Stock of Mr. A. C. PHIN, 31 Broad-street, solicit from their friends and the public generally a share of their patronage. Orders, either in town, or from the country will be carefully attended to. Dr. FAYSSOUX will also attend to the duties of his Profession. After selling his business, Phin appears to have been involved in political activities and traveling overseas. In the 1850 Charleston Census, Phin is listed as a farmer. Soon he was back in business. In January of 1853, Phin formed a partnership with Charles H. Panknin. The following ad appeared in the Charleston Courier on January 28, 1853. THE subscriber having, from the 1st instant, associated with him in business Mr. A. C. PHIN, will hereafter carry on the same under the firm of PANKNIN & PHIN, and would respectfully solicit a continuation of that patronage to the new firm so liberally bestowed on me for many years. C. H. PANKNIN. THE COPARTNERSHIP OF PANKNIN & PHIN having been dissolved on the first instant, parties having claims against the firm are requested to present them at once for payment, and those indebted to make settlement with either of the underigned. THE SUBSCRIBERS BEG TO INFORM THEIR friends and the public generally, that they have formed a Copartnership under the title of PHIN & DORN, for the purpose of carrying on the APOTHECARY AND DRUG BUSINESS in all its branches, at 129 Meeting-street, third door north of Market. Having made arrangements to be supplied from some of the first manufacturing house in Europe and in this country, they flatter themselves from their experience in the business to be able to offer the public articles of the very best quality and carefully compounded. Particular attention will be paid to the preparing of PHYSICIAN'S PRESCRIPTIONS at all times, either by day or night. AN OLD DRUG STORE UNDER A NEW NAME.-We take pleasure in calling the attention of our readers to the advertisement of E. H. KELLERS & CO., in another column. This new firm has succeeded to the well-known concern of PHIN & DORN, at the same old stand in Meeting-street, near Market, and are determined to keep up the reputation of their store. In addition to a large and well assorted stock of drugs, they have a fine soda-water fountain, where customers can be served with the most refreshing beverage at any hour of the day. We wish them all success. The add for Kellers & Company was right above an ad for Panknin's Herpatic Bitters, which they sold. C. F. Panknin was the proprietor and he was located just 4 doors away at 123 Meeting Street. In the 1870 Census he is again listed as a farmer. Briefly in the middle 1870s, Phin was working as druggist, but did not own his own store. In the 1880 Census he was again listed as a farmer in Blackville, South Carolina. He is never again listed in the Charleston Directories and he died on June 5, 1895 at 85 years of age. No information was found specifically connecting Finley & Phin with bottling of mineral water and it seems likely that this bottle dates 1836-1839. Richard Montgomery Meigs, third son of Major John Meigs and Elizabeth Henshaw, was born at Middletown, Conn. In 1796 he moved with his father and family to New Hartford, Conn. In 1802 he was sent to Albany, NY and lived for some years with his uncle Daniel Henshaw, on North Pearl Street, near State Street, and was a student in the office and drug store of Dr. Thaddeus Pomeroy, to whose business he afterward succeeded. In October, 1842, he moved with his family and a part of friends and neighbors of Albany and along the Hudson, to Wisconsin. Some remained in Milwaukee, others bought and took up land between there and the Indian Reservation, mostly between Waukesha and the Nashota Mission, forming a neighborhood of mostly New York State and New Jersey people. Mr. Meigs died at the age of ninety-six, retaining to the last his interest in public affairs. I found Meigs was born on August 8, 1787 in Middletown, Connecticut. As early as 1813, he is listed in the Albany Directory as a druggist. He married Maria Keeler in 1814 at Albany. From some time prior to 1819 and after 1825 the firm was known as R. M. Meigs & Company. From some time prior to 1830 to1839, Meigs was on his own until he became the Sergeant at Arms in the State Assembly in 1839. The following year, T. Pomeroy was listed as Meigs successor at 4 Exchange Street. In the 1850 Census, Meigs was listed as a farmer in Ottawa, Wisconsin. In the 1860 and 1870 Censuses, he is listed as living in Knox Township, New York. He died there on January 11, 1884. Note the use of "purity" in this advertisement, which matches his use of "pure" on the glass bottle and seems to confirm the approximate dates of this bottle. Rushton & Aspinwall were leading druggist of their time in New York City. In 1827, William L. Rushton opened a drug store at 81 William Street, which was previously the dry goods store of Reuben & Henry M. Sikes. James S. Aspinwall does not appear in the directories prior to the partnership. Rushton and Aspinwall joined forces in late 1830 at the 81 William Street location. In 1833 they opened a second location at 110 Broadway. In August of 1833, they first advertise the sale of soda water, but at this point it appears that they only operated a fountain and did not bottle. They sold the water on a ticket system, which appears to have been popular at the time. Fifty tickets could be purchased for one dollar and could be redeemed at the 81 William Street store. It is important to note that they moved their William Street store from 81 to 86 William in 1835 and in 1836 they added a third location at 10 Astor House. In May of 1836, we find the first mention of soda waters being bottled by Rushton & Aspinwall. Soda and Seidlitz waters were mentioned as being sold. The Seidlitz name comes from the Seidlitz Saline Springs of Bohemia, which were popular as a mild cathartic to assist in bowel movements and were a combination of tartaric acid, sodium bicarbonate, and potassium sodium tartrate. A July 1839 advertisement again mentions soda water in bottles and there is on mention of Seidlitz water. The history of this firms bottling of soda water will be continued in the next chapter. The 1836 and 1839 advertisements mention that their bottled waters were available for shipping. The English style bottles were conducive to shipping as their bottoms were rounded. This allowed them to be packed on their side, which kept the corks moist and prevented them from drying out. This allowed the contents to retain their charge as dried out corks would have let the pressurized gas leak out causing a flat soda. As mentioned previously, the move from 81 to 86 William Street is important in dating Rushton & Aspinwall bottles. The earliest bottle bears the addresses of 86 William and 110 Broadway and not the 81 William Street address. This would mean that these bottles cannot date earlier than 1835 as prior to this date the address was 81 William Street, an address that does appear on any known bottle. It is also noted that their first ad that mentions bottling of soda water was in 1836. Therefore, it seems likely that these bottles were manufactured during the fall 1835-spring 1836 glass manufacturing season for use during the summer of 1836, which corresponds with their advertisements. Since the 10 Astor House store was not added until 1836, it would not have appeared on these bottles. Once the mold was cut, it does not appear that they altered it to add the new Astor House address, but chose to leave the address off of their second bottle. The earliest bottle bearing the address comes in at least two color variations, which would indicate two different manufacturing runs. The bottles come in olive green and olive amber colorations. These bottles likely date to the period 1836-1838. The bottle without the addresses is only recorded in olive green and likely date 1839-1840. All of these bottles appear to be of Upstate New York or Vermont manufacture, with Stoddard, Keene or the Mount Vernon factories being strong candidates. Rushton & Aspinwall also have druggist and patent medicine bottles that were manufactured at the same works. An early bottle marked Byran's Ambrosia New-York has been found. The bottle is a dark olive green color and has a neatly formed double tapered top, which is unusual for soda water bottles. Ambrosia was a beverage that is often associated with fruit and honey. A recipe for Ambrosia was mentioned in the Knickerbocker Magazine in 1836. I have not been able to find any absolute evidence of its proprietor, but new research, by Adam Woodward has uncovered that the likely proprietor as Sobrias Watson Bryham. Adam believes that either a mold makers error or anti-English sentiments and ensuing New York City riots (the English Bryham being "Americanized" as Bryan), resulted in "Bryham" being engraved as "Bryan" in the mold. Much of the story below is from Adam's research which he shared with me. Improved Soda and Mineral Waters, prepared by Mr. J. Wilbank; Carbonated English Ginger Pop, a new article,-very superior; Beverage, Porter, Ale, and Champagne Cider; English Ginger Pop, prepared by M'Kennell & Smith; Lemonade, prepared in a new style, and very much approved of; Patent Soda Beer; Wines of the first quality, from the vaults of Mr. P. Wager, of every description: Ice Creams; Confectionary; Fancy Cakes; Raspberries and Cream; and every article in Season. The name Bryham is limited to these two in Philadelphia during this period and it is probable that "Mrs. M. Bryham" was Sobrias' wife Margaret (McClenahan) Bryham. The importance of this association with refreshments and confectionary establishes a relationship between Bryham and carbonated beverages and confectionary. Bryan was in New York City by October of 1834, when he shows up as a member of the vigilance committee for the Second Ward. Bryham is identified as a druggist at 208 Bowery in 1835, a continuation of his occupation in Philadelphia. His first advertisement in New York was for a Compound of Sarsaparilla, being sold at the confectionary store at 208 Bowery. In September of that year, he is looking for confectioners and a couple of weeks later he announced his "Bowery Steam Confectionery… is in full operation." He had introduced steam machinery to improve the manufacturing process. In February of 1836, he opened a "branch store" on 239 1/2 Grand Street in New York City and in August he "built a commodious Saloon attached to his Bowery Steam Confectionery… where he pledges himself to furnish Ice creams of every variety, Lemonade, Soda Water and Mead Syrup, Orgeat, and other beverages suited to the seasons of the richest and most wholesome description." Soon Bryham closed the Grand Street branch, but in December 1836, he announces the opening of new branch store at 276 Grand Street which would be known as the "Grand Street Steam confectionery and Saloon”. He was also seeking two journeymen to work at the branches "who will find constant employment." NOTICE TO THE PUBLIC. The contents of the Confectionery store, No.60 1/2 Division street was sold by order of the Sheriff on Saturday the 10th, for a claim of carpenter work held against us of $150, which money I gave to BRYAM two months previous to pay the said claim, but he spent it in rioting and dissipation. The whole stock and fixtures was bought in by Bryam’s assignee… We have been in business together since the 17th of march last, and during that time he has swindled me out of $300, which I can prove. I have bound him over for threatening to set the said store on fire - and on Saturday evening last I have him taken to the watch house and kept him there until morning for treating to shoot me with a brace of pistols to which a dirk was attached, and were taken to the station house. The character of this monster is too well known to the public to require any further disgrace from me than by simply saying he is an Englishman and a scoundrel and deserves not the patronage of the American public. The residence of this villain is 208 Bowery, and known as the Bowery Steam Confectionery, which is a great bore as was ever puffed by any foreigner to deceive the public. He has made an assignment of his property and tells his creditors that he has stopped specie payment till the banks resume again. Since his failure he has shown me upwards of $1,000 at a time which he has concealed in a belt round his person and defy anyone to get it. -B. BAKER. The bolding is mine to highlight anti-English sentiment that existed at the time as communicated to me by Adam. Another Englishman, Alexander T. Blake, landed in New York in the middle of these riots quickly parted for the Mid-West where he established a mineral water bottling establishment in Cincinnati. He also had poor business and closed up after six months and returned to England after earning the necessary funds. NOTICE - The copartnership formerly existing between S.W. Bryham and Benjamin Baker, in the confectionery line, at the store No.60 1/2 Division st., was fortunately dissolved on the 10th day of June, 1837. This is to give notice that I will not be responsible for any debts of said Baker's contracting. - S.W. Bryham, No. 208 Bowery. BRYHAM'S SALOON ENLARGED.-A CARD.-S. W. BRYHAM of the Bowery Steam Confectionary and saloon for ladies and gentlemen, respectfully informs his numerous friends and the public, that he is always prepared with Ice Creams, Lemonades, Meads, Sodas, Ices, &c. &c., various delicacies as they come in season, for their accommodations, as also the best assortment of pure and wholesome confectionaries, manufactured on the improved principals. ... S. W. B. intends to devote his whole and sole attention to his Bowery Establishment, as also Mrs. B. to the confectionary department and with the united exertions of both, hope to still merit a continuance of patronage already so extensively experienced with many thanks for past favors. S. W. BRYHAM. Bowery Steam Confectionary and Saloon, No. 206 Bowery opposite to Rivington st. This advertisement proves that Bryham's wife Margaret was very involved and experienced in this business and was likely the Mrs. Bryham in Philadelphia five years earlier. His last directory listing was in the Longworth's New York Director for 1838-39 and published in July, 1838. On April 12, 1838, Bryham made his "declaration of intent" to support the Constitution of the United States and reject the Queen of England (he was really English). According to a biography, a William T. B. was born to Sobrias and Margaret on December 6, 1836. It was noted that William's father died in his early childhood and his mother remarried a Mr. Nicholson and moved to Philadelphia. It is likely that Sorbias died in later 1838. This is supported by the fact that Bryham is listed in the "Dead Letter" section of the papers at the end 1838 and early 1839 and his wife appears in this section in 1840, when she likely moved back to Philadelphia. Note the similarity of the Bryan bottle to the Rushton & Aspinwall bottles. The Bryan bottle dates to the mid 1830s and if Bryham's bottle, which seems likely, dates 1836-37. It was likely manufactured by an Upstate New York or Vermont glass manufacturer. Adam found his bottle three blocks from the Bryham's Steam Confectionary at 208 Bowery. Bryham was advertised heavily and usually individuals that went to the trouble of having a private mold made were big advertisers. It would be a lock if an advertisement for the Ambrosia could be found from Bryham. Alexander Thomas Blake was an Englishman whose family had a long association with producing and bottling of mineral water. Alexander Thomas (A. T.) appears to have been the adventurer and his brief stint in the United States produced the earliest documented soda water bottle from the Midwest. Alexander Thomas Blake was born on May 20, 1811 to Alexander (A.) Blake and Ann Ovey in the West Indies. A. Blake was an early London druggist and chemist who was in the partnership of Kernot & Blake in 1806 at 33 St. James' Street. By July of 1811, A. Blake moved into the old established drug store at 56 Piccadilly corner of Albany (47 after renumbering in 1820) in London. The store was operated by R. Haywood for a couple of years and previous to that, for many years by Edmund Lardner, whose recipes A. Blake had acquired. It appears that A. Blake had worked for Lardner earlier and had developed some of these compounds, such as a prepared charcoal dentifrice, that Lardner was selling. PURE WATER.--AERATED POTASH WATER, made from pure distilled water, was originally prepared by A. Blake, Chemist, 47, Piccadilly, corner of Albany, under the direction of one of the most eminent physicians in London, and has by its excellence, won its way to the tables of the most distinguished personages, where it is now very generally preferred to soda water: in flavour it is equal, or indeed more delicious, while as a salutary beverage (especially for those suffering under calcareous complaints) its superiority is undisputed. A. Blake begs to caution the nobility, gentry, and others, who have honored him with their commands for the much-admired Aerated Potash Water, made from pure distilled water, against imposition: he has, in consequence of a spurious article being offered to the public, had the words "Aerated Potash Water, Blake, 47, Piccadilly, "engraved on the bottles, which he trusts will secure to his customers, without any difficulty, the genuine article. From the Superiority of the much-approved beverage, A. B. has received her Majesty's commands for a regular supply. He also manufactures superior soda water, from the purest sesqualcarbonate of soda, which he sells in bottles bearing his name and address, as well as the following aerated waters;-Magnesia, Seltzer, Ammoniated, Orangeade, and Lemonade. A. B. recommends his syrups of Lemons, Oranges, Ginger, Cepillaire, and Raspberry Vinegar as very pleasant additions to Potash and Soda Water. Warranted equal if not superior to that obtained from the Fountain. FAMILIES can now be supplied with this delicious and wholesome beverage at their own homes, and avoid the inconvenience (as heretofore) of having to go out in the public streets to get it. It is sold at 75 cents per single dozen, and less in proportion to the quantity taken--making the article as cheap as it is usually sold, and (considering the general convenience obtained) much more desirable. The attention of Masters of Steam Boats, Hotel and Coffee House Keepers, is also respectfully solicited. It can be procured at most Drug Stores & principal hotels, and of the Preparer, ALEXANDER T. BLAKE. Sycamore street, third door below Columbia street. Where also may be had Saratoga Water in great perfection, and choice variety of Syrups to suit every taste. Blake's foray into the bottled soda water business does not appear to have been successful in Cincinnati. Perhaps the Panic of 1837, a public that was not interested in his product, or a lingering distaste for Englishman at this time contributed to his struggles. In 1839, if not in the Fall of 1838, he used his knowledge of pharmacy and chemistry to secure a job at Burdsal's drug store, one of the leading firms in the city. His 1839-40 directory listing bears "(Eng)" in the text, which stands for England, the location of his origin. Other entries in this directory record the state the listed party came from. A. T. appears to have returned to England on the Steamship British Queen at the beginning of August in 1839. On his return to England, A. T. does not rejoin his father and younger brother in the business. Younger brother Charles T. joined the family business by 1841, and in that year, the firm traded as another incarnation of Blake & Son. This firm became Blake, Sandford & Blake in 1845 and this firm continued to produce aerated beverages well into the early Twentieth century. 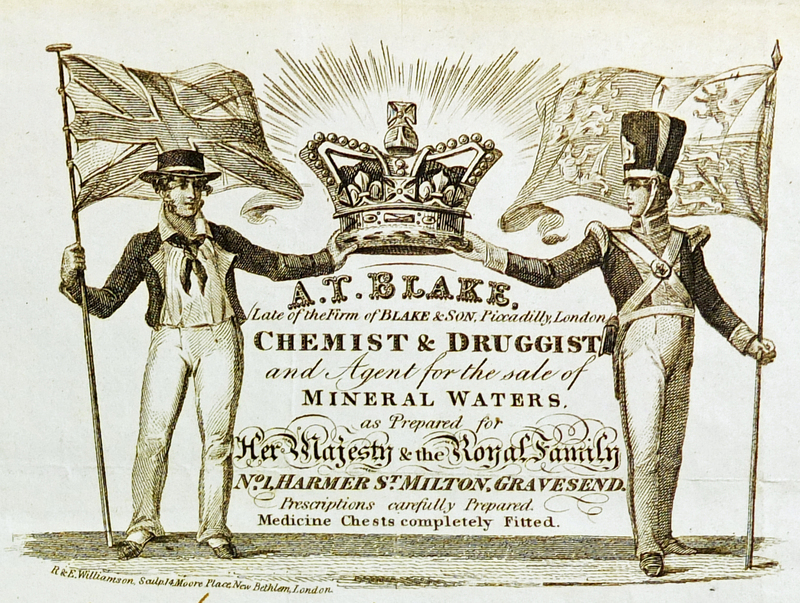 By 1840, A. T. Blake made his way to Gravesend in Kent, England and was selling mineral waters in addition to being a druggist and chemist. He remains in Gravesend thru 1847, but for some reason he and his wife traveled back to the United States in 1846. It is interesting that in that year only an A. Blake was operating a feather store in Cincinnati. In 1851 A. T. is in Surry. The last viable references that I can find for A. T. was his arrest for allowing gambling in his hotel, the Lord Nelson Inn, in June of 1852 and a listing in a 1856 London Directory. The Blake bottle dates to 1838 and is peculiar in form, color, and finish. The bottle's form is an egg shape, but not a well formed bottle as compared to the English bottles of the same period that would have been familiar to Blake. Perhaps Blake had difficulty in describing the form of the bottle to the mold maker. The color is a bluish aquamarine, again unusual, and the top bears a double taper, which again is contrary to the typical finish to the English bottles. Perhaps this was the only finish tool available to the glass blowers at the factory. It is interesting that the same type of lip finish was used by another Englishman, Bryan, in New York. Based on the age, it would seem that the bottles were blown at Pittsburgh, but could have been made at an early Ohio glass manufacturer. Much more history of Elias Durand is available in the previous chapter. In 1835, Durand stated bottling of mineral water and opened a large establishment on Sixth Street above Arch. The apparatus for manufacturing the waters, and especially that part of it for bottling under pressure, was his own invention and superior to any then in use in France or the United States. The illustrated advertisements for mineral water in bottles were found in 1835 and 1836 newspaper advertisements. This business was in full and successful operation when the money crisis of 1837 hit and Durand, with a great loss, was forced to close this branch of his business. Correspondingly, no ads were found for the mineral waters in 1837. After this experience, he adhered closely to his pharmacy profession until his retirement and he sent the bottling apparatus to the Société de Pharmacie, where it was placed into use in Paris. The Durand bottles of this period are small, which matches the description in the period advertisements, were the waters are selling for $1.75 per dozen, with a 75 cent deposit. This would be roughly 8 1/2 cents per bottle. They are also of a unique shape, being almost square in appearance. Perhaps the reason for this was to accommodate his newly invented bottling machinery. There is little doubt that these bottles were manufactured at the Dyottville Glass Works in the Kensington section of Philadelphia. Their dates place it before Thomas W. Dyott's bankruptcy. Additionally, these bottles come with two styles of lips indicating two different runs. The earlier bottles have a tapered collar, while the later bottles have a heavier rounded collar. It seems likely that the newer bottles' collars were modified to better support the bottling apparatus as they are stronger in form. It also appears that a run of the larger sized bottles was made during this decade. I have excavated a shard of a quart sized Durand bottle, that is noticeably different in color that his earlier bottle. Unfortunately, neither the base nor the lip was found. I have heard of another damaged example of this bottle and perhaps it has a story to tell. The large sized mold was kept at Durand's drugstore after he abandoned the bottling business in 1837. The business passed into the hands of his son, Alfred B., and Emil Tourtelot as Durand & Tourtelot in 1852. They moved the store to 718 Chestnut to make way for the Howell Building, which was constructed on the site at Sixth & Chestnut in 1854. This building was later modified to become the Public Ledger Building. In 1857, Tourtelot left the firm to start a business of his own in Germantown and Alfred continued the business on Chestnut Street. The following year, he moved to 1228 Chestnut Street and he sold the business to one of his employees, E. R. Perrot, in 1860. So what does this have to do with the mold? Well Durand's large sized mold, likely brought from France in 1825, and used during the 1830s made its way from the store at Sixth and Chestnut, to the store at 718 Chestnut, and then to the store at 1228 Chestnut, where it was sold to Perrot, who had the mold modified to add his name so he could sell bottled mineral water. That makes this one of the most interesting and likely longest use of a bottle mold of which I am aware. Eugene Roussel de Prunay was born in about 1811 in France. His family seat was the Chateau de Condi Vailly sur Aisne, which his family held since 1647. During his early years, Roussel worked for the firm of Laugier Pere & Fils in Paris and was the director there. He fought against the French Government and was compelled to leave the country. He left from Harve, France on the ship Sully and arrived in New York on July 11, 1838. He soon after traveled to Philadelphia and established a perfume store at 75 Chestnut Street, below Third Street. For more than thirty years previous, this location was the store of Henry Schively, a cutler and surgical instrument maker. Roussel started the bottling of mineral water in 1839. His first bottles are aqua in color and unlike later bottles do not have the word "Patent" on the reverse and are very light in weight. Roussel was soon to unleash a craze the likes of which the soda water business had not seen and whose reverberations would be felt until the present time. The fuse had been lit and the soda water business was about to explode!